Annadale Roofing Ltd are roofing specialists in Merseyside offering professional roofing services in Manchester, Chester, Stockport, Liverpool and throughout the UK. Roof replacement & re-roofing services - Roofs of all types can be replaced in the UK. Re-roofing to the highest standard, guaranteed works on your roof replacement in Chester, Merseyside & beyond. Flat roof repair services - Experts in flat roof repair work, Annadale Roofing Ltd will survey your property and recommend the best flat roof repair or flat roofing solution for your home or business, Annadale is a flat roofing company working throughout Merseyside, Liverpool, Chester, Stockport & Manchester. Pitched roof repairs – If you are looking for pitched roof repairs in Liverpool or Merseyside, Annadale Roofing Ltd has experienced roofers in Merseyside, Liverpool and nearby ready to carry out your repairs. Chimney repairs - Extreme weather conditions and general wear & tear are just two of the many factors that can result in a chimney requiring repair. Annadale Roofing Ltd are experts when it comes to chimney repairs in Merseyside, Liverpool, Chester, Stockport & Manchester and they can identify and rectify chimney damage efficiently and professionally with their local roofers. 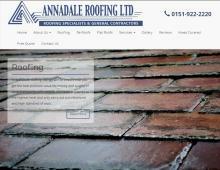 Annadale is a highly recommended roofing company covering Manchester, Liverpool, Chester, Stockport and across the UK. If you are looking for roofing specialists then give Annadale a call today. Guttering cleaning services - Gutters clogged with leaves and other debris can cause water to flow over the sides potentially damaging your roof or causing it to leak. Annadale Roofing Ltd can clean your gutters to ensure there are no blockages allowing water to flow freely, protecting your roof and building. Gutter repair - A clear gutter can still pose a problem if it is damaged. If there are leaks or the gutter is sagging it has the potential to cause water damage. Annadale Roofing Ltd can identify and carry out your guttering repairs quickly to avoid any further damage. Gutter installation - Unfortunately some damage is beyond repair. If this is the case a replacement gutter can be sourced and installed in minimal time. Contact Annadale Roofing Ltd if you require a new roof or flat roof repair in Merseyside, Stockport, Chester, Liverpool or Manchester. Free quotations available for all roofing and guttering services in the UK.